World Sculpture Racing, as it was known, was a series of races held annually from 1982 to ’85 during the Cambridge River Festival. “Part street-theater, part performance art, part sporting event,” local sculptor Pat Keck, one of the key artists involved, once described it. “What we want to do is create an art form that has a mass appeal that has the context of a popular art form, a popular thing like a race, but also works on a high level, that is the pieces could be shown in an art gallery or a museum as well,” Geoffrey Koetsch, who co-founded the shenanigans with Kirby Scudder, said back when they held a sculpture race in Wisconsin in 1987. So Herold set about reviving it. His background is in performance art. Perhaps his most prominent project, he says, was being one of the lead organizers of “Ring Out,” which invited thousands of people to surround the World Trade Center site in New York during the 2004 Republican Convention and ring bells for peace. Here, one thing lead to another and Jason Weeks, executive director of the Cambridge Arts Council, got him in touch with Koetsch. Back in the day, Koetsch and Scudder curated the entries from established artists, Herold said. This time around he called it “People’s Sculpture Racing” and had an open call for entries as well as offering youth building workshops. 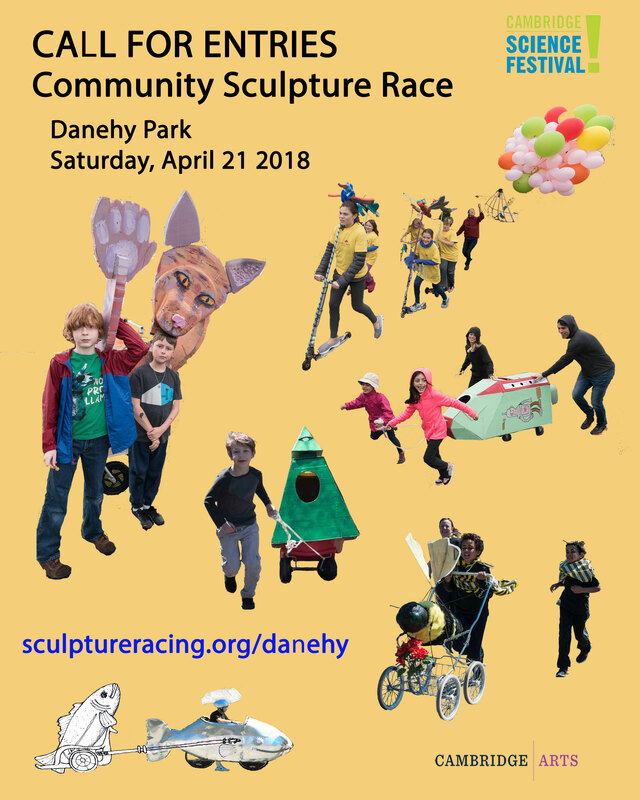 Some 16 sculptures arrived for today’s madcap, 3/4-mile race at the Cambridge River Fest—a 23-foot-long fish, a giant rat trap, a caterpillar-bike, a giant sculpture of a belt-sander, a papier-mâché donkey. Then they were off—the first sculpture racing here in 30 years. Leaving the south corner of University Park Commons, they ran southwest along Sidney Street, turned left onto Meriam, then northeast along Purington, left onto Cross Street, a jog across Landsdowne Street, to Franklin Street and the finish back at the park. “I think we were in the lead and then we took a wrong turn,” said Adria Katz of the Somerville-based “Everything Muffin Collective,” which took second in their caterpillar-bike. Greg Cook is a co-founder of WBUR’s ARTery. Follow him on Twitter @AestheticResear or on the Facebook.